III CTZ headquarters was at Bien Hoa, a suburb northeast of Saigon. U.S. II Field Force Vietnam (II FFV), its counterpart organization, was based at Long Binh. These headquarters should not be confused with the ARVN Joint General Staff (JGS) and Military Assistance Command, Vietnam (MACV), also in the Saigon area at Tan Son Nhut. III CTZ reported to the JGS; II FFV reported to MACV. ↑ Corps is usually a tactical, rather than geographical structure; the U.S. renamed its Vietnam War corps formation s "field forces" to avoid confusion. 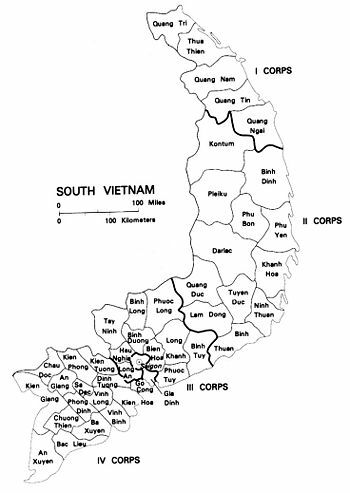 In July 1970, the Republic of Vietnam redesignated its CTZs as Military Regions (MR). ARVN MR numbers, however, had no relationship to the People's Army of Viet Nam's MR numbering scheme. This page was last modified 19:52, 4 July 2010.